Army I m thinking of fielding. The Mask Of The Furnace; Earthing Rod; Level 4 Wizard. Battle Standard Bearer; Talisman Of Preservation; Great Weapon. Crown Of Command; Great Weapon. Musician; Stanadard Bearer; Deathmask; Razor Standard; Great Weapons. Musician; Standard Bearer; Ba'hal; Banner Of Eternal Flame. Daemonsmith Sorcerers one law of fire other law of metal. Bull Centaur Taur'ruk has Crown of Command (bearer and unit are Stuborn). In BC unit. Sure I ll be up for some play testing when I get the last few bits sorted out and I m a bit more mobile. Got abit if feed back from another forum and made the following changes. Charmed Shield; Talisman Of Preservation; Earthing Rod; Level 4 Wizard; The Lore of Death. Dispel Scroll; The Lore of Fire. Battle Standard Bearer; Sword Of Might; Dragonhelm; Dawnstone; Ironcurse Icon; Shield. Crown Of Command; Blackshard Armour; Great Weapon. Musician; Stanadard Bearer; Deathmask; Great Weapons. Crown Of Command; Talisman Of Protection; Blackshard Armour; Great Weapon. Musician; Standard Bearer; Ba'hal; Great Weapons. Dropped 2 BC from the unit to give them GW's and to give Taur'ruk a Ward Save. 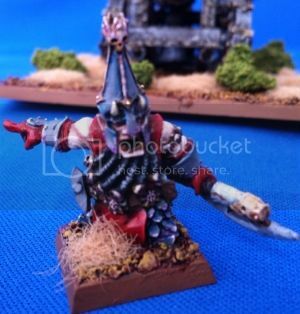 right just got to get the last ten IG and I've got all the Choas Dwarf I need for army.